Samuel Ward (1577-1640) was born in Suffolk, the son of John Ward, minister of Haverhill, by his wife Susan. Nathaniel Ward was his younger brother. Another brother, John, was rector of St. Clement’s, Ipswich. Samuel was admitted a scholar of St. John’s College, Cambridge, on the Lady Margaret’s foundation, on the nomination of Lord Burghley, 6 November 1594. He graduated B.A. in 1596-7, was appointed one of the first fellows of Sidney Sussex College, Cambridge, in 1599, and commenced M.A. in 1600. Having finished his studies at the university, he became lecturer at Haverhill, where he was a successful evangelical and became the ‘spiritual father’ of Samuel Fairclough. On 1 November 1603 he was elected by the corporation of Ipswich to the office of town preacher, and he occupied the pulpit of St. Mary-le-Tower with little intermission, for about thirty years. 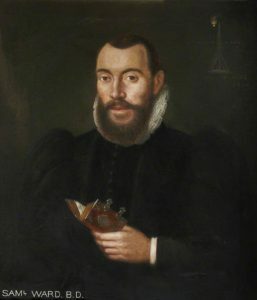 In 1604 he vacated his fellowship at Sidney College by his marriage with Deborah Bolton, widow, of Isleham, Cambridgeshire, and in 1607 he proceeded to the degree of B.D. He was one of the preachers at St. Paul’s Cross, London, in 1616. In 1622 Bishop Samuel Harsnet prosecuted Ward for nonconformity in the consistory court of Norwich. Ward appealed to the king, who referred the articles exhibited against him to the examination of Lord-keeper John Williams. Williams decided that Ward, though not altogether blameless, was a man easily to be won by fair dealing, and he persuaded the bishop to accept Ward’s submission and not to remove him from the lectureship. He was accordingly released from the prosecution; but the king wrote to the Ipswich council to deter them. In 1624 Ward and Yates, another Ipswich clergyman, complained to a committee of the House of Commons of the Arminian tenets broached in A New Gag for an Old Goose by Richard Montagu. The session was drawing to a close, and the commons referred their complaint to the archbishop of Canterbury. Ward subsequently incurred the displeasure of Archbishop William Laud. On 2 November 1635 he was censured in the high commission at Lambeth for preaching against bowing at the name of Jesus and against the Book of Sports on the Lord’s day; and for saying that religion and the Gospel were in imminent danger. He was suspended from his ministry, enjoined to make a public submission and recantation, condemned in costs of suit, and committed to prison. His fellow-townsmen declined to ask the bishop of Norwich to appoint another preacher, as they hoped to have Ward reappointed in despite of all censures. Christ is All in All. (Colossians 3:11) – pdf, 13 pp. The Life of Faith – pdf, 26 pp. The Life of Faith in Death, Exemplified in the Living Speeches of Dying Christians. (Revelation 6:7-9) – pdf, 28 pp. A Coal from the Altar to Kindle the Holy Fire of Zeal. (Revelation 3:19) – pdf, 23 pp. Featured in The Digital Puritan, Vol.II, No.2. Balm from Gilead to Recover Conscience. (Hebrews 13:18) – pdf, 21 pp. Jethro’s Justice of Peace. (Exodus 18:21-23) – pdf, 21 pp. A Peace-Offering to God for the Blessings We Enjoy Under His Majesty’s Reign, with a Thanksgiving for the Prince’s Safe Return. (1 Thessalonians 5:18) – pdf, 15 pp. Woe to Drunkards. (Proverbs 23:29,32) – pdf, 12 pp. The Happiness of Practice. (John 13:17) – pdf, 14 pp.